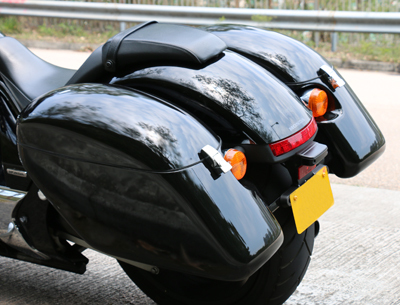 Tsukayu Hard Saddlebags for Fury are specific hardbags for Honda Fury, made of high quality hand-laid fiberglass which is much stronger than chop-gun fiberglass. They are mounted with Tsukayu new designed bolt-on brackets without relocating stock rear turn signals. Mounting Brackets are made of very strong, show chrome, 12mm thick, casted solid #304 stainless steel, making Tsukayu's mounting system heavy-duty and extremely stable. 26 Liters of Storage Capacity for each side of Hardbags for Fury. The bags come chrome plated lockable latches, alloy front hinges and all Mounting Hardware you needed for installation. The inside is carpet lined which protect your valueable stuff from scratching and bouncing inside the hard saddlebags. Options of finishings for hardbags for Fury are ready to paint (primer), gloss black or one tone color match. Quality Chrome Plated Hinges. Hinge area is shorter at the front, more leg room for the passenger. Fit Very Close To Motorcycle Fender. Dimension of "Hardbags for Fury"